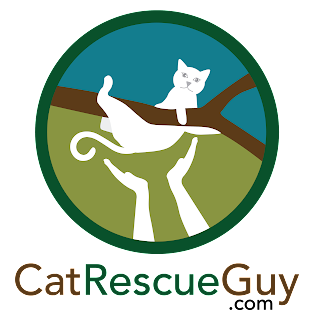 Whenever I get a call to rescue a cat, I always ask the owner how the cat reacts when strangers come into their home. The average cat will stay in place and watch but not approach the stranger or run away. The shy or fearful cat will run away and possibly hide. A friendly, confident cat will approach and greet the stranger. 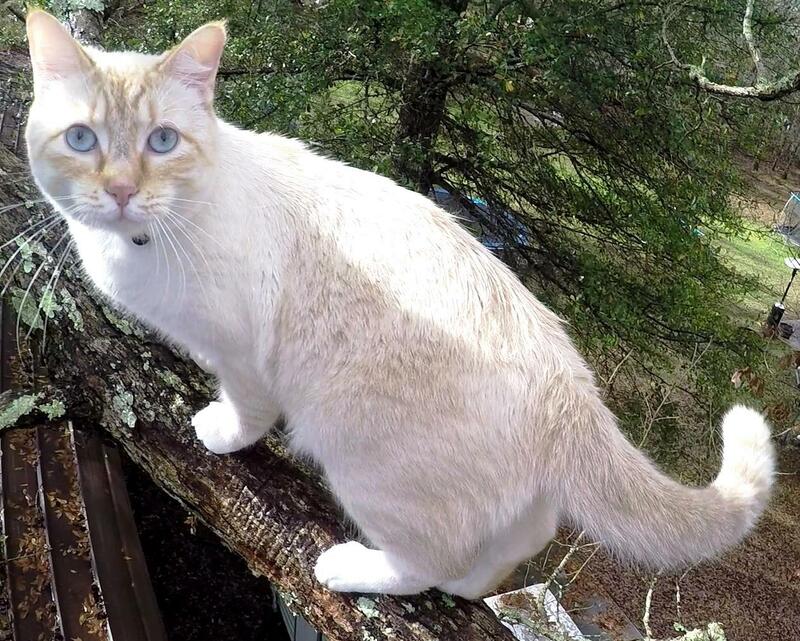 When I asked Kerry about his cat, Simba, he didn't hesitate to say that Simba always happily greets everybody. 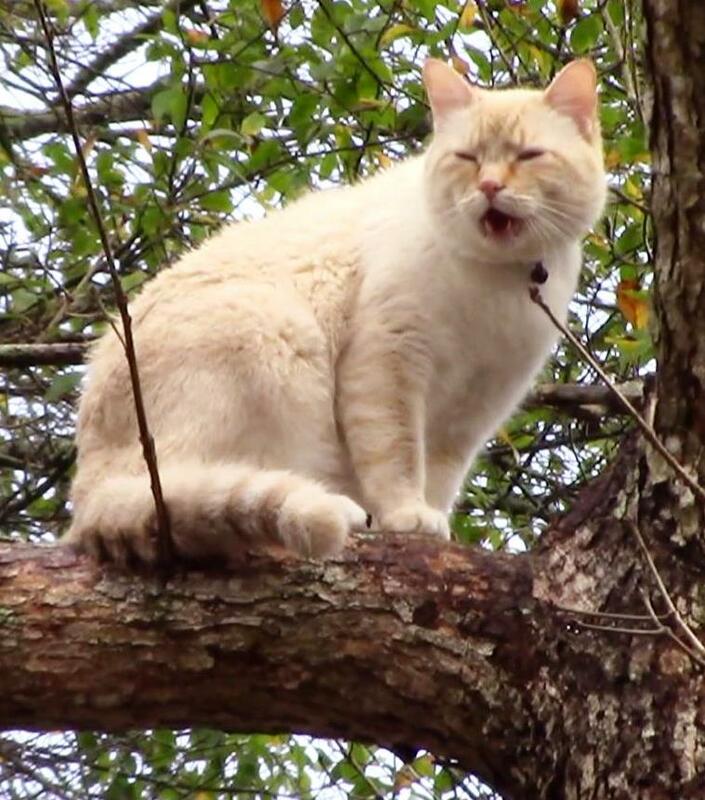 I love hearing answers like that, because it usually means that the cat will be cooperative with me in the tree. So, when I went to rescue Simba that morning, I was hoping to find a friendly, cooperative cat. He did not disappoint me. As I drove up the long driveway, Simba was easy to spot in the bare tree at the end of the driveway. 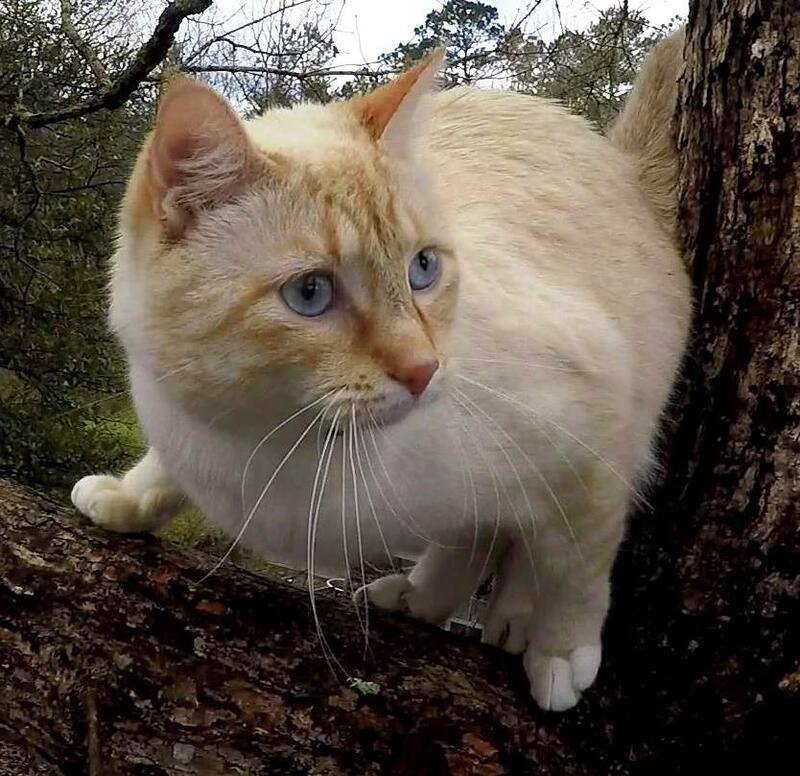 He is a pretty, two year old, blue-eyed flame-point, and he had been in the tree just over two full days. The first night he suffered through severe thunderstorms, including a tornado watch, and he had more rain the second night. Even the misery of those nights was not enough to persuade him to find a way down out of the tree on his own. As I set up, I watched Simba to see how he would react to the throw-weight, string and rope as they all passed by him. He was thoroughly entertained by it all. He sniffed everything and grabbed the string and rope with his paws. I had to stop what I was doing a few times while I waited for him to let go of them, so that I could continue. 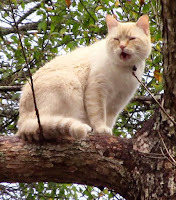 Many cats are frightened by this activity, but for Simba, this was fun. As I climbed up to Simba, he continued to stay relaxed. He greeted me with curiosity and was very comfortable with my presence there. I thought he could be easily lured into a carrier, so I opened a can of food and offered it to him. He came to it readily and ate a few bites. Then I took the food away from him and put it in the back of the carrier. I held the carrier up to him, but he did not want to go inside. His reaction to the carrier was not drastic, but it was clear that he did not like it. I put the carrier away and prepared to use the gloved bag. While I was doing that, Simba put his front legs on my lap and wanted more personal attention. I petted him, and we visited for a few minutes, but it was becoming very clear to me that Simba would be the perfect cat to ride down to the ground in my lap. He was very relaxed, confident and not easily spooked. I have never brought a cat down in my lap before, because I thought it would be too risky. 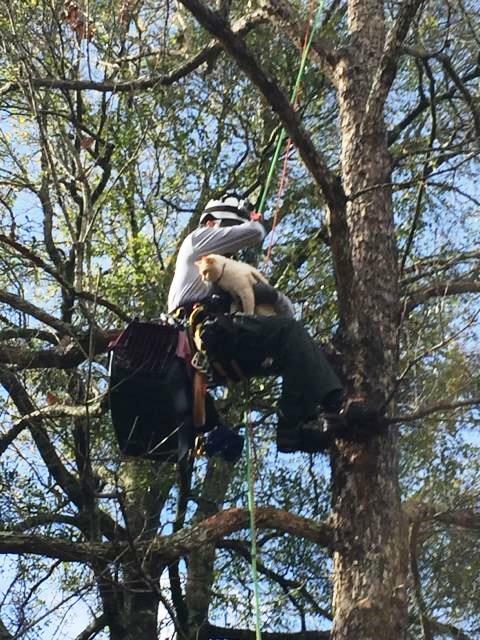 You never know when a cat will change its mind or get spooked by the noise and bumps of pushing limbs out of the way to clear a path downward. They could easily jump out of my arm and either climb right back up the tree or fall a long way to the ground. 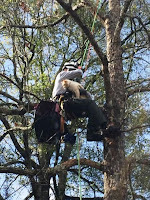 If the cat went back up the tree, it would be more difficult to get him down the second time. But here was Simba, cool as could be in my lap, and we were not very high with a relatively clear path down. Besides, it seemed a bit rude to scruff him into a bag and bring him down in such an undignified manner. So I decided to give it a try. I tucked him in close to my body and down we went. He stayed very relaxed and comfortable all the way down. When we reached just a few feet from the ground, he jumped down and walked over to Kerry. After they got reacquainted, I gave Simba the rest of his food, and I enjoyed spending some more time with this very cool cat. Thank you, Simba, for giving me my first rescue by lap.